"Diarrhea of a Madman". Now THAT'S a great name for an album! "Two Bit Tricks" was a long time in coming. It's been about 5 years since D in D but I'll go on record as saying it was worth the wait. We've come up with some of the best songs we've ever written and the recording is something of an achievement for us also. After the last project, which featured a lot of direct recording and acoustic guitars, we did what we usually do and took a 180. Almost all of the guitar and bass tracks are mic'd amps (and very cool amps at that!). The drums are a good 'ol Yamaha set mic'd with 57's and 421's. We used an 1176 on most tracks when it sounded good and man, the blackface unit we have REALLY sounds excellent. Transparent yet shimmering. I mentioned that the recording has been an achievement for us and I'll tell you why: In the past, when we've mastered our projects (and they've been mastered by some of the best in the business) our "edge" seemed to get lost. The guitars were sucked too far out of the mix and we lost the energy and sound of our live playing. With "Two Bit Tricks" I think we were finally able to nail down a recording that sounds like "us". Not high-fi by any means, but that's for the next project when we get the crane over and load the Studer onto the flight deck. So what kind of sounds are you going to hear on TBT? Let's start with the bass. Joe's lucky enough to have a very nice collection of basses, but this project was mainly a Fender affair. He double tracked a few basses on each song with a '62 Jazz being one of the mainstays. He also used a very cool early G&L bass and a Rick or two thrown in for good measure. Main bass amp for this project was an original Ampeg B-15 Portaflex in the very, VERY groovy blue checked tolex (I'm sooo jealous). We also experimented with a 1950's Berlant tube mixer which we ran the bass signal through to create a really warm, solid low end sound. Paul's drum sound is an IMMENSE improvement over the last CD although I'm not sure why. We used some new compressors and we did some careful experimentation with reverbs so that might be it. Maybe we got lucky or maybe we're just THAT GOOD. Well, maybe we got lucky. However they came about, they're deep, rich and energetic and we're thankful! Yep, and you'll hear it all over this album! I used it for lead work on "I Throw My Heart Away" and for background lead work on a few other songs. Man, it sounds so cool, I could play it all day long! I hunt flea markets for fun and things seem to have a way of following me home. Sometimes BIG things follow me home. Exhibit A and B: a great old Fender Rhodes and an absolutely gorgeous sounding early '60's Wurlitzer piano. You'll hear them played together on "Keyboard Song" (yes, our song titles can be astonishingly creative) and the Rhodes can be heard on "Three Martini Lunch", our hipshot tribute to Burt Bacharach. Why put stuff like this on the CD? We have fun messing around together and wanted to put a little of that on the CD for others to hear. "Three Martini Lunch" is the kind of thing we do for fun after dinner or while we're waiting to start playing "our" stuff. "The concept....the concept... what can we call the album???" No, no I digress... That ship has sailed and I have to let it go. Way back when... Back in the OLD days... back before the Hulk and Spiderman and The Fantastic Four were fodder for Hollywood dullards that wouldn't green light an original story if God came down to earth and commanded it, they were characters in comic books. REAL comic books. The ones that cost .15 cents and .20 cents and (GASP!) .25 cents. We collected comics in those days. Not for money, but because we LOVED them. I loved the smell of those early Marvels. The Steve Ditko art work, the great Stan Lee lines. Nuff said? Not by a long shot!! We used to sleep with comics. We'd cut them up, tear off the covers, paste the heads of Antman, The Avengers and the Justice League onto collages made out of tinfoil (yes, we were weird little SOB's). We'd learn our history from watching Capt. Nazi get his from Captain Marvel Jr. . We'd ruminate on how Captain America was amazingly revived in the 60's and ponder the tragedy of poor Bucky his sidekick that didn't make it. 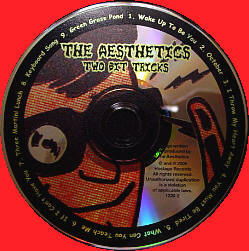 The art on "Two Bit Tricks" is our homage to those great books and the comic ads that were as cool and seductive as the stories they book ended. Many thanks to BLAMO! (aka Danny) for the help putting it all together! So go have a look and a listen and I hope you enjoy the new project. We made some great memories putting it together and hopefully some great music, but that's for you to judge! Thanks again for taking the time to check out the webpage and the band!